It is important that as you continue to strive for high goals and achieve your dreams, you must consider how you go about your business to accomplish your dreams and aspirations. You have to have standards in order to build integrity. When we fail at committing to a standard, we end up being wishy washy about what we do and trail towards the path of mediocrity. 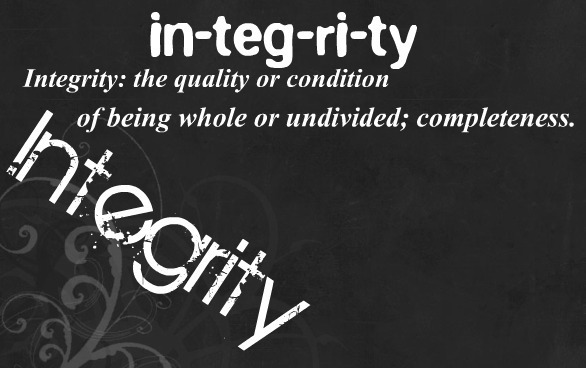 Before I speak of standards ask yourself: What is Integrity? 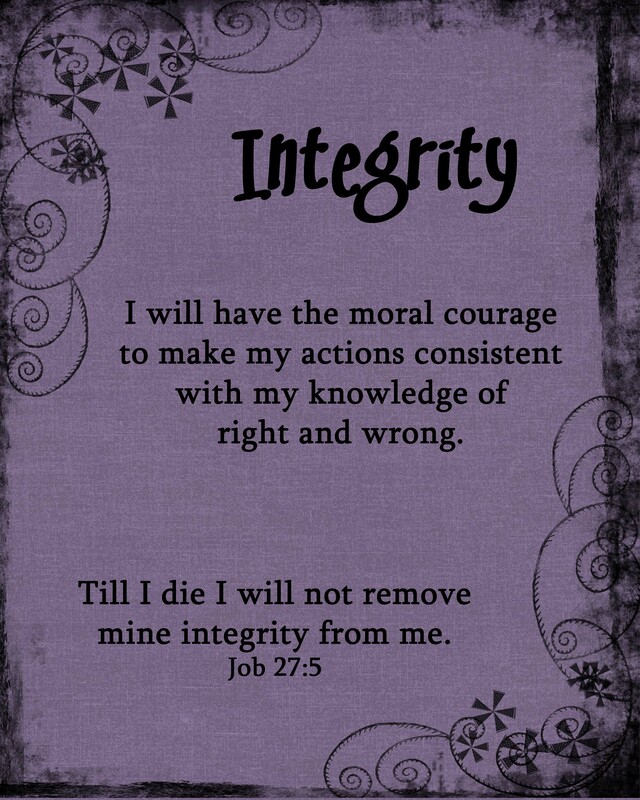 What does integrity mean to you? Do you have it or are you even building towards it? When I speak of maintaining a standard, I mean maintaining a “moral standard” in order to do the right thing. For me, my standards are based on Biblical principles as a guide and it may vary for many people what their standards may be but ultimately you have to remain consistent. When you are consistent in your conduct you will earn people’s respect and gain self-respect. The virtues of having standards are plentiful. What standards can you easily work on? 1. Consistency – When you are consistent, you show that you are reliable and people can trust you to do things because your character remains constant. The virtue of maintaining consistency within your actions means you are a dependable individual and people won’t expect any suprises. You gain favour by valuing this character trait. Those that are inconsistent are unstable and no one can rely on an unpredictable person. If you can’t be trusted with little, you can’t be trusted with much (Luke 16:10). 2. Follow through – If you say that you are going to do something then do it. Many people start by saying they will commit to a task but never follow through. Deliver the goods that you said you would deliver because if you don’t, people will lose their faith and trust in you. This is also a part of remaining consistent with your actions. If you say you will show up at 8:30am to work then be there at 8:30. Being mediocre about what you are being trusted to do exemplifies a level of disinterest and lack of concern for the task that is entrusted to you. It is intolerable by the business world standards and neither should you cultivate such shoddy behaviour. Commit to your responsibilities and people will be able to guage how adept you are at following through to the things they require of you. If you are uncommitted in your heart then don’t volunteer for tasks that require responsibility. Rather keep your mouth shut instead of performing at unsatisfactory levels. The whole point of following through is to build a positive character that can build a positive reputation. If you perform below the base level of expectations, then you set yourself up for failure. 3. Finish what you start – Complete what is required of you. Many good projects have a strong beginning but during the process some people drop the ball and never end up completing the project as a result. If you want to be results oriented, then you have to start with the end in mind. You have to follow through to the end. Finishing what you start means that you are a person that is goal oriented. When you have goals and you complete them, there is a level of satisfaction that comes upon you on a job well done. The race is not for the swift nor the strong if you remember the fable regarding the hare and the tortoise. If you need to take your time to finish something then take your time if needed as long as you complete the task with quality versus quantity. The quality of work must be emphasized here. Quantity counts but it is useless if you have it without it backed by quality. Don’t distract yourself with what the other person is doing and concentrate on what you have to do. If you get side-tracked you’ll make a mess of what you are doing. Remain focused and block out distractions. Distractions hinder you from reaching your goals. 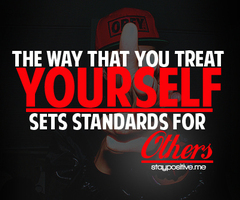 Having standards helps maintain your integrity. 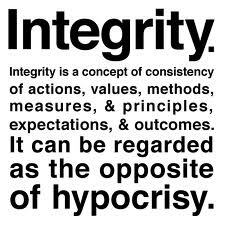 People view those that uphold their standards as powerful and amazing individuals, but people often forget that it takes a lot of work and effort to maintain your integrity. You have to do the basic things like the 3 tips I have listed here as a starting point to build your integrity and create a standard for yourself. Do not be like everybody else because you are unique. You have to define the standards that you will uphold and then follow through. Do not be like a leaf that is moved by the tossing of the wind; be firm like a tree that has it’s roots that reach far deep into the ground. When you maintain a standard, you will grow in it and you will not be easily shaken. The Consequence of having NO Standards – I believe that if you have no standards then you are guided by loose morals. There is a saying that comes to mind that says, “If you don’t stand for something you will fall for anything”. Such an individual is fickle-minded and can easily betray your confidence since they have nothing that the truly follow to the end. They remain inconsistent and they are successful at disappointing people with their actions. They do not see a need to change because they are moved by what is convenient for them at the time and are absolutely undependable. Such people lack a true moral compass to walk uprightly and lack dignity. They are unstable in their reasoning skills and in conversations they may agree with everything you say to “appear” like they have a mutual understanding with you when really they don’t stand for anything that is inconvenient to themselves. Watch out for such characters. They manage to cause a lot of chaos in the workplace, in your family and your friendship circles. They know how to do anything for you but at their own pace. They rarely finish what they start and they lack completeness. They are double-minded in all their ways that you can conclude that they are hypocrites. A double-minded man is unstable in all his ways (James 1:7) so remember that you must be very careful when you come across such individuals in your life. Do not entrust them with important projects for they will surely bring it to ruin. I also want to address those that have DOUBLE STANDARDS as well. Don’t be a person that says “Don’t do as I do but do as I say”. Hypocrites love this type of language. I don’t condone it. I believe in the “Practice what you Preach” approach. Having double standards causes chaos and confusion. You don’t want to create a whole bunch of fools with this level of conduct. A fool says “there is no right way of doing something” while a wise person says “there is a correct way of doing something as there are various ways of doing the same thing”. 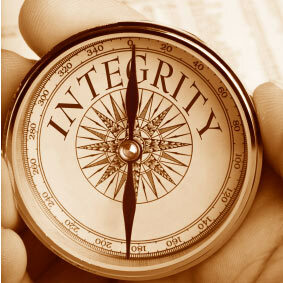 What is your moral compass like today? Are you wishy washy with certain things or do you have discipline? People with standards have discipline whereas those with no standards or those that operate in double standards act with mediocrity.They lack integrity by nature since their actions are tied to their loose morality. Build yourself and maintain a Standard that you will follow through to the end. Consistency is dependable and finishing what you start proves that you are steadfast. My Last Note: Please understand that my discussion of maintaining a standard doesn’t mean that you won’t battle with your weaknesses. 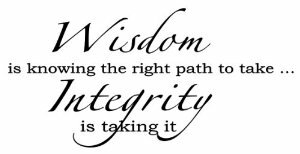 Having said that, it is important to understand that just because you have weaknesses in areas that you find difficult to follow through doesn’t mean that you lack integrity because to have integrity you have to work hard at it. You don’t become a person of integrity just like that because it’s always a work in progress. However, if you don’t strive to a standard then you are walking in the path of mediocrity. Standards help to build your integrity and helps boost your reputation. However, Integrity is more important than having a reputation. Reputations are built on how others see you whereas integrity is built while others aren’t always looking. Choose to have standards that you can walk in and you can use the three points I have provided as a guide to get you going. If you’ve been walking in confusion for a while and don’t know how to get to that stage of discipline then seek an accountability partner that can be your mentor to help you walk uprightly. You are not an island to yourself so it’s important to practice self-discipline if you want to learn how to have Integrity with the help of others. I personally still am a work in progress so it’s safe to say that I haven’t “arrived” but I will continue to work hard at it. This post is intended to encourage you and boost your character to a new level of thinking. I hope it helps you and feel free to pass it onto others that need this message. Remember: Have stability and remain consistent; have standards and you will become a person of value, stature, and a person of Integrity. Beautiful post. Intergity says so much and sometimes we don’t tend to know we let ourself and love one’s down.I learn a long time ago in a relationship not to promise anyone anything, because you never know whats going to happen. And sad thing about it, they don’t care what your reason maybe. All they know is you didn’t keep your word to them like you promise. You so on a roll today, your blog is helping me while Im on my journey; Thank You for sharing your wisdom with the ones in need…:) Loving the different quotes as well as the scripture you shared. I know I will be back to read more on this topic. I’m doing commenting while typing and reading homework. If more people’s actually cared about they character instead of there reputation. The world would be so much better. I rather my character speak for itself then my reputation. If you walking and living for GOD is will speak it your words, your heart, your soul. 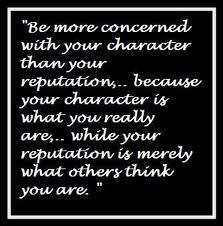 Let the character show them who you are and not reputation. Thank you PJ! You know, as I was writing this it really dawned on me that reputation isn’t as important as integrity. I feel like as I write, God keeps giving me capsules of wisdom and I just go with the flow of what He is pouring into my heart. I’m glad that you were encouraged with the quotes and scriptures. I need a dose of good news so I always look for motivational quotes and scripture to start my day. Very well said. One of the things we in this society have made a lost art. 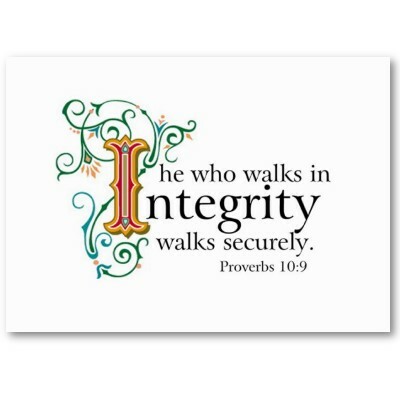 Unfortunately, integrity has far too often given way to selfishness and self-centeredness. Situational ethics abound. Very encouraging reminder of something so desperately needed. Well written, and the time you put into it.God bless you dearly. Thanks for visiting and reading. May we all learn to grow by Godly standards to maintain our integrity. Thanks for your kind comment. I’m glad this post blessed you. Hola! I’ve been reading your site for some time now and finally got the courage to go ahead and give you a shout out from Humble Texas! Just wanted to tell you keep up the fantastic job!